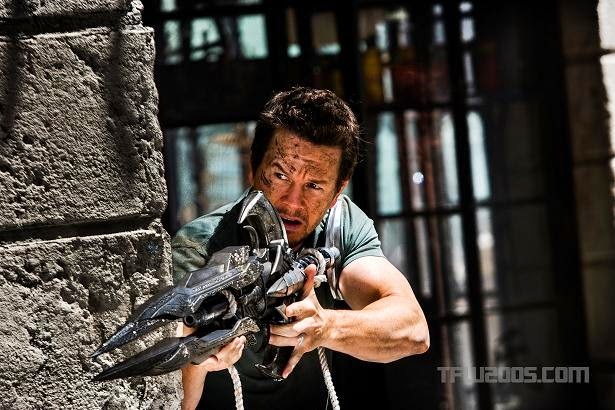 Collider has posted all its interviews (links below) with the core cast of Transformers: Age of Extinction along with Michael Bay. The interviews last summer while filming in Detroit at the China set so its the usual combo of sales pitch while trying to avoid revealing spoilers. For me the most interesting part was the Collider's list of facts they learned from the set visit. Almost missed it but we finally have the full names of Stanley Tucci's and Sophia Myles' characters (Joshua Gross & Darcy Tyril). Highlights below, click links to read the full interviews. Pics from here. - Bay: "This is not as different, but there’s a really funny character, this guy who’s fighting in here, he’s called Hound. He drips bullets. He’s literally got every gun known to mankind. He’s grizzled. He’ll fight when you tell him to fight, and he’s fighting down to the very, very, very last round of every gun, all the way down to a little Swiss Army knife. [laughs] He’s a really funny character. The robots on this one have more character." - Bay on the humor: "It’s still fun, but it’s more serious, and we’re playing it like people are going to die." - Bay on filming in 3D: "3D is always better when your brain has three or four seconds. You get the most 3D effect when it starts about three to four seconds, that’s when it starts feeling 3D. And then what you do, quick shots are always flat. But the weirdest thing is, your brain tricks itself into thinking its 3D, when it’s not. I could give you a test. It just does this weird thing. But fast shots are always flat." - Bay and Hong Kong: " It’s such a mixture of amazing buildings next to an apartment tenement, you know? I saw this apartment, I walked in and it was just like a courtyard and I saw more air conditioners and stuff, and I came up with this whole action sequence right there. Like, “Oh, let’s parkour down,” in this great crazy chase where you can literally jump and grab on stuff and hang on stuff and make your way down. So, they don’t really have that here, but I just think it’s a different look." 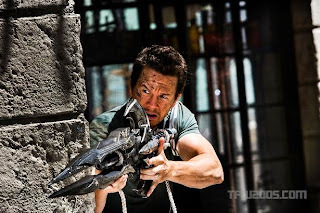 - Wahlberg: "We get to Hong Kong in about three minutes. [laughs] The exact line in the movie that I have is, “How fast can this thing get us halfway around the world?” He says something like, “2:54.”[laughs] Because we don’t have that kind of time, so… Can’t get there much faster. But yeah, so we’re here now. It’s one of those things with Michael … I spoke to him about what he’s comfortable with me saying and not saying, pretty much that I’m playing a single dad who’s an ambitious inventor, and that’s pretty much it." - Stanley Tucci: "I play Joshua Gross who’s the head of this corporation that sort of makes all the Transformers. I don’t know what I can and can’t say." - Sophia Myles: "My character is called Darcy Tyril, she is English, she’s a geologist and in this movie she works within the mining division of Stanley’s character’s company." - Producer Lorenzo di Bonaventura says that this film has more in common with the original Transformers than any of the other films in the series. - The new Camaro and Corvette are both concept vehicles that are modified with after-market parts. - The Detroit-based Hong Kong set took 16 weeks to build from start to finish. - Depending on the scene, there are always anywhere from four to ten cameras running during at any given time. - There are about 18 new robot characters in this film. - It takes ILM about 15 weeks to build the geometry for the robot models, and another 15 to 20 weeks to build the skeletal rigging for it. Then come painting and texturing, followed by constant tweaks to each robot depending on the format and lens used in each scene. - Most of the robot animation is done with keyframe animation, with motion capture being used only when they’re trying out new types of stunts. - A VFX team spent a few weeks photographing every angle of buildings in Hong Kong in order to be able to digitally recreate the city.